Haymaker’s ancestors, the Doanes, first arrived in Morgan County in 1822. They were one of the Quaker families who came from North Carolina to help build the Moon Mill two years before Samuel Moore started the town of Mooresville. Seven years later, the Haymaker family arrived and for almost two centuries, the Doane/Haymaker descendants have been witness to the entire story of the development of Mooresville and other parts of Morgan County and that history is not lost on Randy. Haymaker told the story that Samuel Moore had a policy when he went about starting the town. He plotted the town and if he met someone he thought would be good for Mooresville, he gave them a plot of land for free. He met the Rusie and House families on their way to homestead in Illinois. He offered them plots of land and they stayed. Today, Tony Langley, a descendent of the House family, is a member of the Town Council. That is but one example of the long history of service to the community by descendants of the founding families. If anyone understands what it means to be an active contributor to his community that would be Randy Haymaker. The list of honors awarded to Haymaker range from the Sagamore of the Wabash and Mooresvillian of the Year in 1989 to the Excellence in Leadership Award from the Indiana Economic Development Association and Lt. Gov. Becky Skillman, and the Leadership Appreciation Award from the Indiana Democratic Editorial Association. 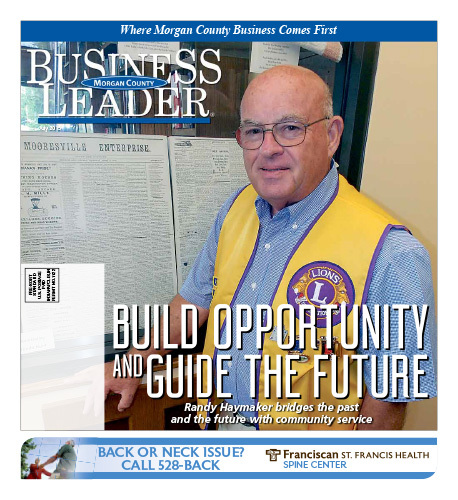 Download the full July 2015 Edition here.